This broiled asparagus recipe is quick, easy, delicious, and beautiful. Pairing it with a hard salty cheese and a bright squeeze of lemon brings out the best in asparagus and takes just minutes to prepare. In spring and summer, try serving this as an appetizer at small get-togethers, as it takes less than 10 minutes and guests always love it. Depending on the size and nature of the crowd, you can serve this with cocktail napkins rather than dishes and forks, allowing guests to grab the individual spears and eat with their fingers. It’s casual indeed but adds to feelings of fun and spontaneity at parties. Now, you may ask: Why Pecorino instead of Parmesan? Pecorino Romano and Grana Padano are both in the Parmesan family, and both are less expensive than Parmigiano-Reggiano. Furthermore, I both melt better when shaved, and so both work better for this dish. For a Spanish tapas spin, Manchego would be delicious. Preheat broiler on high.Toss asparagus spears with olive oil and salt until evenly coated.Spread evenly on baking sheet, avoiding crowding or overlapping.Broil for 4 minutes.Check for doneness, shake baking sheet and rotate before returning baking sheet to broiler. Continue to broil in 2 or 3-minute segments, checking often for doneness. Warm serving dish slightly by placing in the oven, microwaving (with a tablespoon of water in dish, and then drying) or running under warm water (and drying). 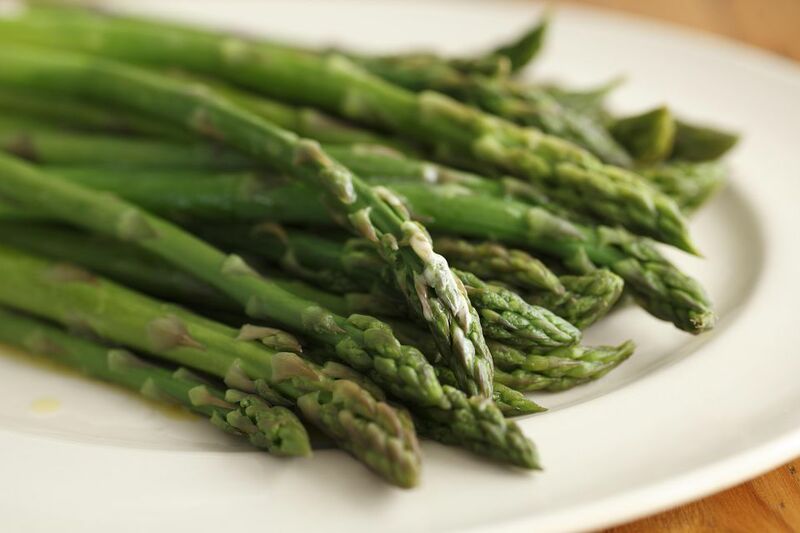 Quickly remove asparagus from broiler and place in a serving dish. Cover sporadically with shaved Pecorino Romano or Grana Padano cheese.Squeeze lemon over all.Grind black pepper over the entire dish, generously.Serve immediately. Cooking time will vary depending on size and thickness of asparagus spears.